It takes time for any blackjack novelty to reach the main stream, but once it gets accepted it stays for a long time. Whether blackjack is not very suitable for frequent changes or the players themselves like their game the way it is, it’s something to think about, but as long as the Suit ‘Em Up Blackjack side bet concerns, things are pretty clear. 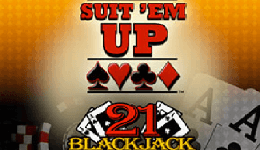 This side bet was introduced by a few Vegas casinos in 2013 and a couple of years later we see many casinos installing their Suit ‘Em Up Blackjack tables. Finally, the game got its worthy counterpart in the online gambling world with two respectable providers releasing their versions of this game. 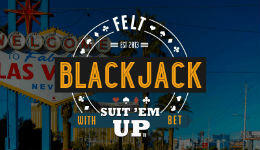 At the moment, you can find the Felt’s and the RealTime Gaming’s blackjacks featuring this side bet at online casinos. They are not identical as you can read below and the RTG Suit ‘Em Up Blackjack is the only game that offers this interesting side bet to the US players. As we’ve mentioned above, Suit ‘Em Up is a side bet which means it does not affect the main game. Moreover, it won’t affect the player’s strategy either, since the outcome of this bet is known after first two cards are dealt. Placing the chips into the Suit ‘Em Up box, you are betting that your first two cards will be in the same suit. If that happens you will be paid according to the pay table and wins range from 2-1 all the way to 60-1. Every Suit ‘Em Up blackjack table features a circle of the same name right next to the main bet box and it can be used after the player places the regular bet. There are no specific limits for Suit ‘Em Up side bet, so general limits apply. However, similar to Perfect Pairs or 21+3 Blackjack, you are not required to place your side bet and you can stick with the main game only. It’s simply an adjunct to the standard game of blackjack and it is decided on your first two cards. Using this bet, you are betting that your first two cards will be suited. The biggest payout comes with two suited Aces and it usually stands on 50-1 to 60-1, depending on the casino. For suited blackjack you will be paid 10-1, therefore if you get an Ace of spades and a King, Queen, Jack or 10 of spades, you will receive a prize ten times your Suit ‘Em Up bet in addition to your blackjack win. If you get a suited pair, you will be paid 5-1, 3-1 for a suited eleven and 2-1 for any two cards of the same suit. Keep in mind that this side bet has nothing to do with your regular blackjack game and that you can win it even if you lose the main bet and vice versa. In fact, that happens frequently. The game is usually played with 2, 6 or 8 decks of cards. Number of decks: Felt – 6, RTG – not posted so either 6 or 8. Side bet house edge: Felt- 4.7%, RTG (6 decks) – 3.4%. It is important to mention that the Suit ‘Em Up side bet comes with a lower house edge when played with more decks of cards. Unlike the main game that pays better when fewer decks are in play, the side bet increases your winning odds with every new deck involved. That is mainly due to the fact that with fewer decks there is a greater frequency of two-card 21s and players receive 3-2 payouts for blackjacks, while the house takes even money if the dealer gets a blackjack. On the other hand, with more decks there is a greater chance your first two cards will be, for instance, same suited Aces. So, if you have a chance to choose the table, always go to the one with more decks in play if you intend to use the Suit ‘Em Up side bet repeatedly. While the main game requires both, luck and strategy, in order to play it successfully, the Suit ‘Em Up bet depends on your luck only. You will also have to do some math before deciding which table to choose. If you opt for fewer decks (one of the basic blackjack strategies) you will increase your winning odds for the main game, but also reduce your chances to win the side bet. For example, with two decks in play the house edge for the main game and the Suit ‘Em Up side bet stand at 0.18% and 9.41% respectively. Add four more decks and you the things are dramatically different 0.4% for the main game and 3.41% for the side bet. The conclusion comes by itself – if your strategy includes frequent Suit ‘Em Up bets, opt for games with more decks in play. However, if you just want to try out the side bet and see how it works, pick those with fewer decks.